Please browse an image to upload. Creating an RDF work takes three steps. for people around the world to use. Why convert from table data? As an example, suppose you want to define the data shown on the right. RDF is represented by a combination of these three. Data in RDF format is easy for computers to use, but has the disadvantage that its structure is hard for people to understand. 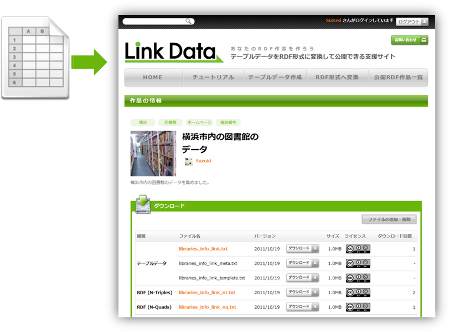 ② That data can be converted to RDF and then downloaded. These features have been achieved. When you upload table data, it will be published as an RDF work. When the page for your work is created in LinkData, the data will be in the form that many people can use. © 2011- Year LinkData, All rights reserved.